JOIN US this week for two special events. Time to ditch that lawn! Save money while saving water. A few days ago, Jameson Lake spilled over Juncal Dam. This is the highest, but smallest reservoir in the Santa Ynez Rivershed. This is the source for the Montecito Water District. When the lake fills to the brim, the water starts down its natural path known as the Santa Ynez River. The next stop is Gibraltar Dam and then on the Lake Cachuma which is bound by Bradbury Dam. I have painted each dam several times…here are my interpretations of Jameson Lake and Juncal Dam. You can see the Rose Compass exhibit at Westmont Ridley Tree Museum of Art. Our long history with drinking water has led to building 3 dams and reservoirs to meet our water demands in the city of Santa Barbara and Goleta. It seems dams and reservoirs are not the ultimate solution to water management, and these 3 dams are our "Last Straw". 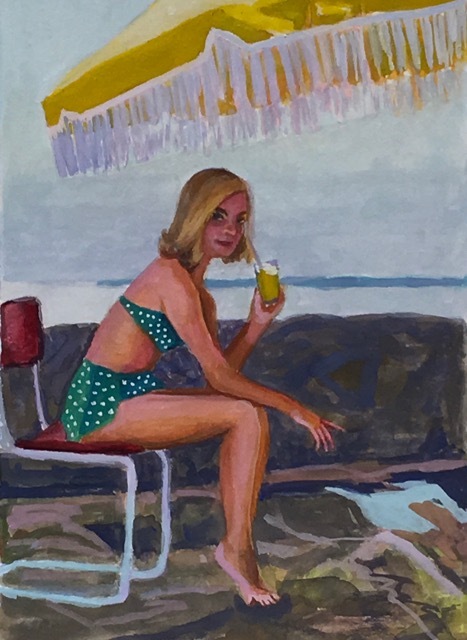 The “Last Straw” paintings reference our recent ban on drinking straws (2018), which will help mitigate our plastic solution. "Juncal Dam as a Teacup. "This conceptual piece shows the size and era of Jameson Lake and Juncal Dam which is our second oldest (1930) water reservoir in Santa Barbara County,. It's size and style of teacup is in relation to the Gibraltar Dam (1910) as Stacked Teacups and Lake Cachuma (1940) as a Jadeite Batter Bowl. A Cowboy Bathtub is superimposed over Jameson Lake and Juncal Dam. This tub would have been common when the dam was built in the early 1900’s and is representative of the dam capacity in relation to Lake Cachuma and Gibraltar reservoir which are the other reservoirs that feed Santa Barbara County.